Hotel Emmantina is a fully air-conditioned 4-star modern hotel situated in the fashionable beach resort of Glyfada, only 15 kilometers from the heart of the city of Athens and the Acropolis. Our excellent location allows our guests to commute easily to unique archaeological sites, historical buildings and museums. 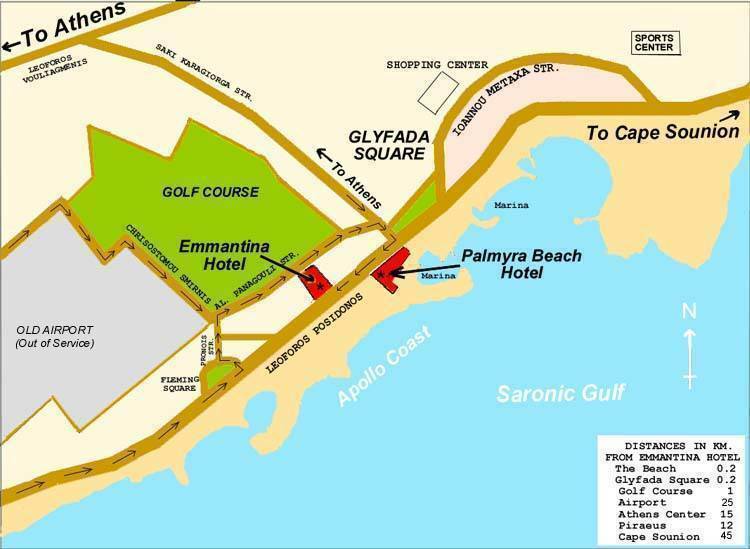 The hotel is located 200 meters from a sandy breach, 1 km from Athens International 18-hole golf course. Glyfada Square with its modern shopping and sports centers, its lively Greek tavernas, marinas and bustling night life, is only a few minutes walk and provides our guests with infinite pastime possibilities. The Aghios Cosmas sports complex is only 3 kilometers away. The Port of Piraeus, a get away to the islands, is only 12 kilometers away. The hotel features: a panoramic roof garden with swimming pool and bar, an elegant restaurant serving a la carte menus with Greek and international dishes, a lounge bar, a conference and banqueting room, a tourist shop, and night entertainment in the hotels discotheque club. Apart from an internet surfing desk facility, all hotel areas feature fast wireless internet access. Water sports: swimming, water skiing, jet skiing, wind surfing, pedal boating, canoeing, paragliding, yachting, sailing, fishing, snorkeling, diving. Sports: Tennis, Basket ball, Soccer, Volley ball. Our guest rooms are air-conditioned, sound proof and comfortably furnished with inviting balconies overlooking the Apollo Coast. Standard features in all rooms are: fast internet data port, direct dialing telephones, color television featuring satellite channels, music console and room safes. The bathrooms are modern and feature hairdryer and telephone. All reservations must be guaranteed by a credit card deposit equivalent to one night's stay charge. This deposit is collected immediately upon confirmation of the reservation. If the reservation is cancelled 3 days or more, prior to the arrival date, then the deposit will be refunded. If the reservation is not cancelled at least three days prior to the arrival date, then the deposit will be forfeited. From Athens Intenational Airport (Eleftherios Venizelos): Get onto highway Attiki Odos, follow signs to Athens then signs to Vari then signs to Glyfada. This brings you onto Leoforos Posidonos which is the main coastal highway on which the hotel is located at number 33. From Athens Center: Follow signs to Sygrou Avenue then signs to Glyfada. This brings you onto Leoforos Posidonos which is the main coastal highway on which the hotel is located at number 33. From the Port of Piraeus: Follow signs to Faliron then signs to Glyfada. 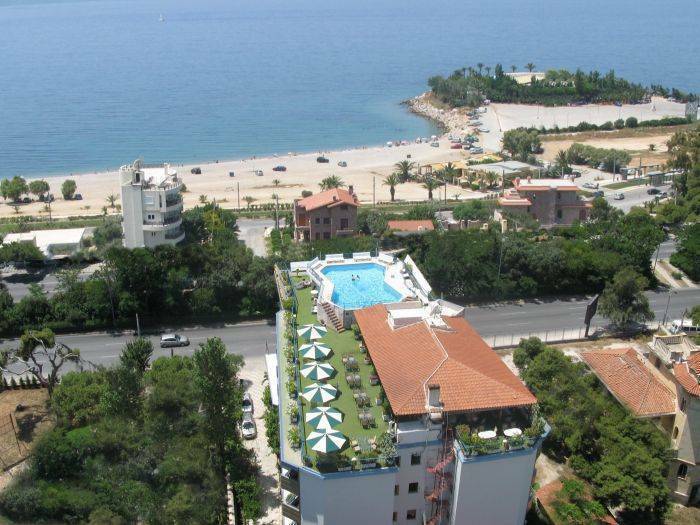 This brings you onto Leoforos Posidonos which is the main coastal highway on which the hotel is located at number 33. (a) You may use the Express X96 BUS. The bus terminal is outside Exit No 4. The bus stop for the Hotel is GLYFADA 5th STOP (50 meters from the Hotel Entrance). The bus runs 24 hours approximately every 25 minutes. Buses:Many public buses run along the main road (Leoforos Posidonos) just in front of the hotel every 15 minutes. The bus to Athens downtown is marked A2. The bus to the port of Piraeus is marked A1. For bus tickets contact the front desk. Taxis:You can either flag down taxis on the main street in front of the hotel or you can request the front desk staff to call or book a radio-taxi. Taxis are readily available. From midnight to 05:00 hrs. taxi fares are double of what they are during other hours. During the Christmas and Easter periods a special tariff is introduced and given to the driver as a gift. Hotel Mini Bus:Transportation of guests to and from the airport with the hotel 13-seater mini bus is available. Guests must make such transport arrangements well in advance. Contact the Reservations Department. Närmaste flygplats: ELEFTHERIOS VENIZELOS INT'L AIRPORT 25 KM.